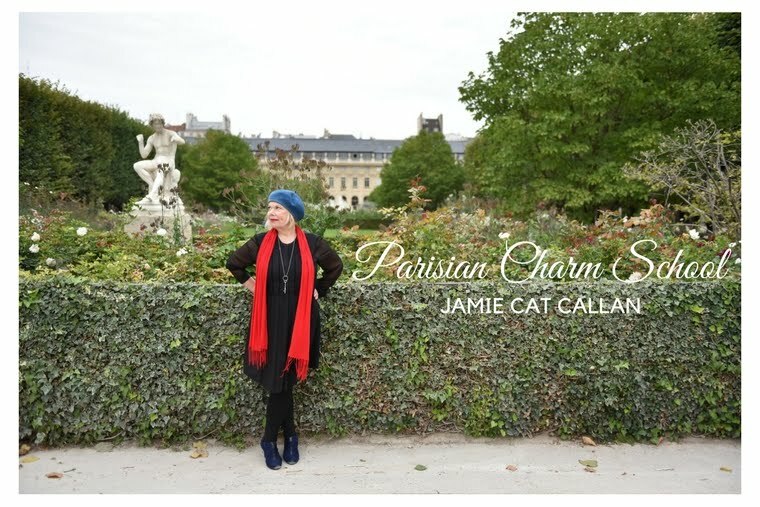 Jamie Cat Callan: Bonjour, Art Nouveau! Today I went on an Art Nouveau tour with a group of seven lovely scientist-wives from all over the world. Our husbands are all scientists and geo-chemists attending the annual Goldschmidt Conference. We met at the conference steps, took a metro and then walked with our Czech tour guide through New Town over to Old Town, staring up at the gorgeous decorative buildings all along the way. 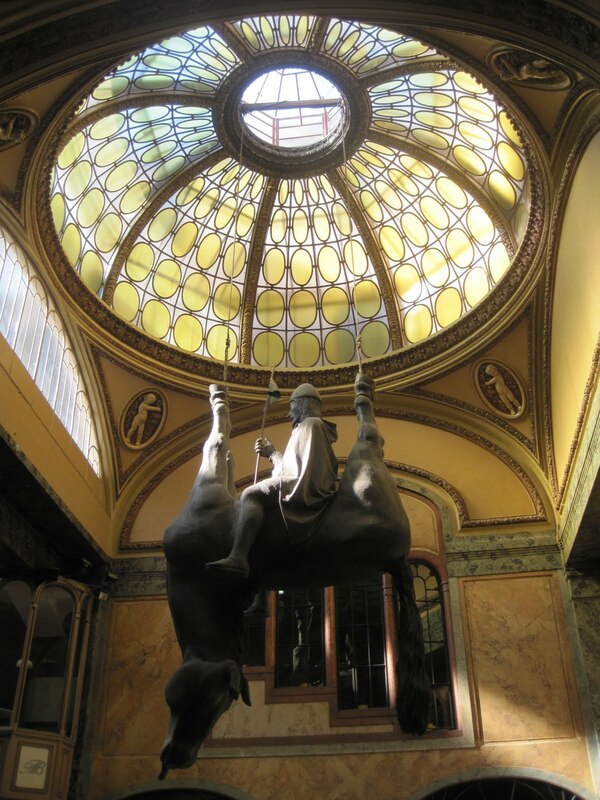 It's hard not to go anywhere in Prague without staring upward in awe! The Art Nouveau movement was famous for beautiful stain glass windows and ornamental flair. The artists were less floral and a little more subdued than the Rococo style of the mid-19th century, but more effusive than Art Deco which came in the 1920's. 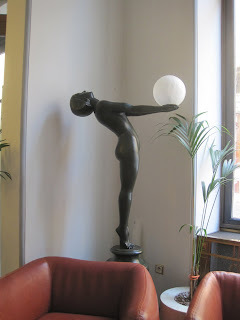 J'adore Art Deco! 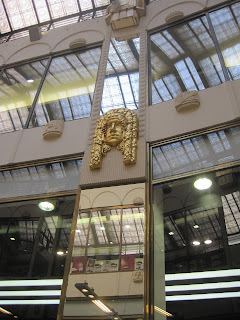 Of course, we are staying in an Art Nouveau hotel. 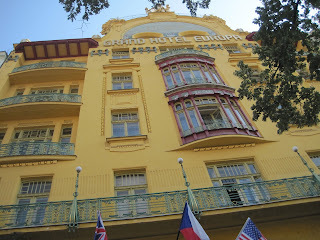 Hotel Paris! (Where else would a French-loving-gal want to stay?) 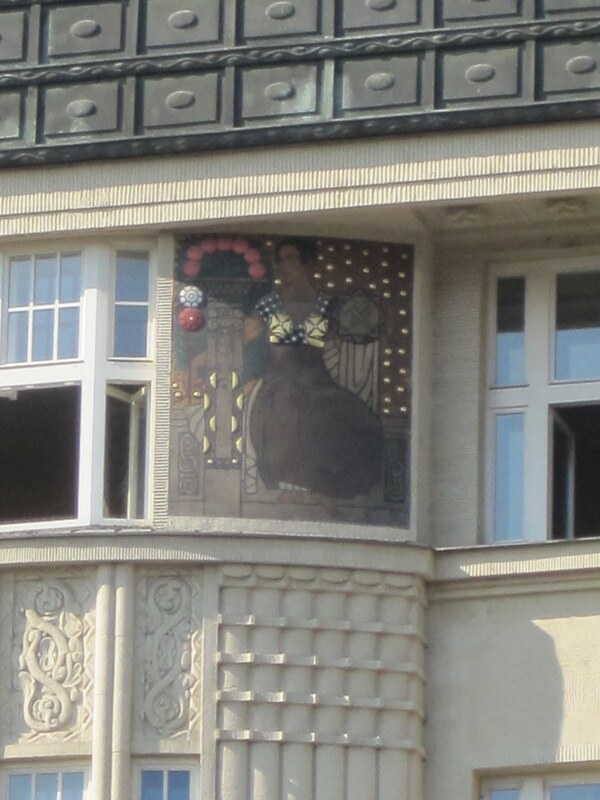 By the way, it was the French wife of a Czech president Tomas Garik Masarik that brought Art Nouveau to Prague at the turn of the 20th century. 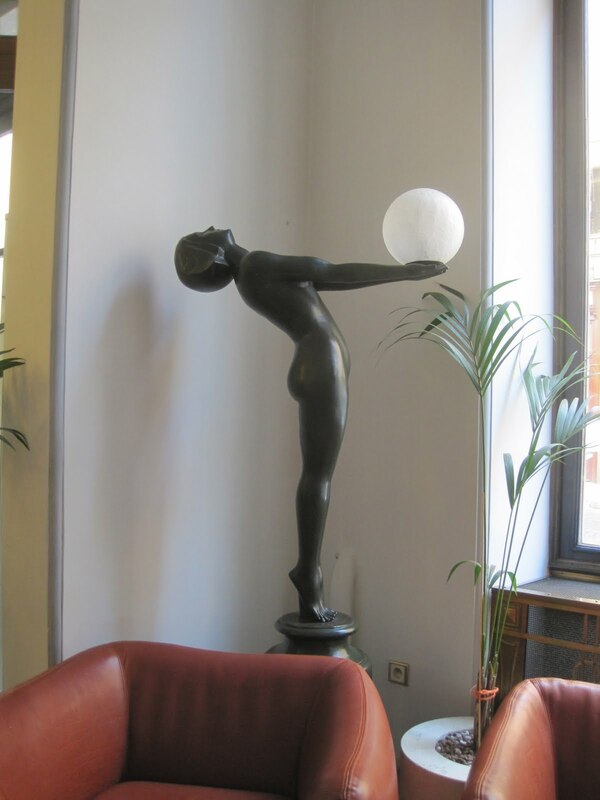 And then soon after, the famous Art Nouveau Czech artist Alphonse Muca who was born in the Czech Republic and studied art in Paris at the Academy, brought his beautiful style back to his beloved homeland. 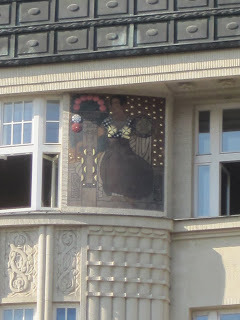 He became famous after drawing the theatre portraits for the French actress Sarah Bernhardt. Ooh la la! Everywhere I go, I see the French influence! Jamie these images are so interesting. The details are intricate and beautiful. What a fabulous way to spend a few hours totally immersed in art. What a wonderful trip! I was just watching a Rick Steves' segment about Prague moments before I read this post. Beautiful!! 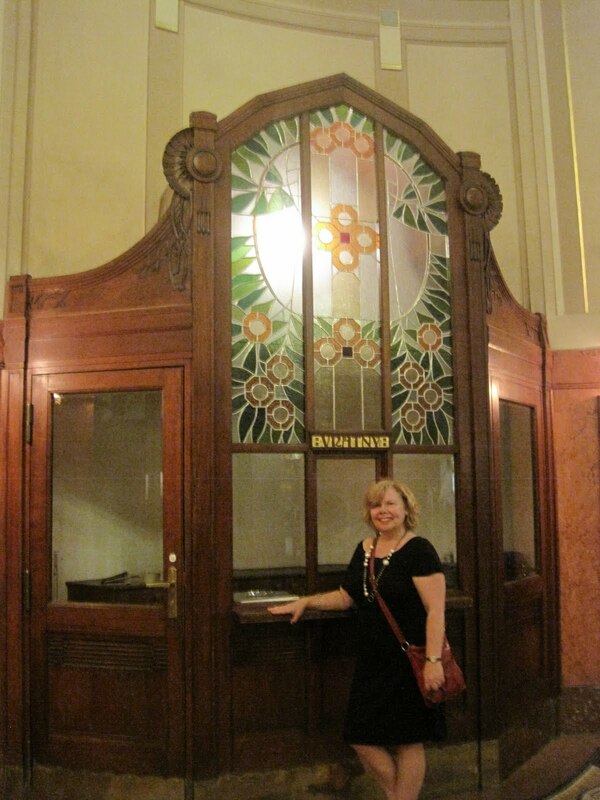 Not only do I love seeing you on two feet -- footloose and fancy free -- but also in Prague! I was there in 1992 and have always wanted to return... It is SO lovely!